I've always been fascinated by the way we can see and hear. With vision the ability to see in colors has a particular charm, don't you think? At first glance, so to speak, it seems incredible that we don't just view the world in black and white, just like the earliest cameras did, the earliest motion pictures and television. Why not that simpler reality, than the wonderful sensations of full color that most of us posess? Could it be there was a much greater survival factor of those creatures who preceeded us, when thy had the ability to distinguish colors? Even people having so-called "colorblindness" still see things in color. Their views are just more limited in the shades that they see, usually involving a confusion between red and green. 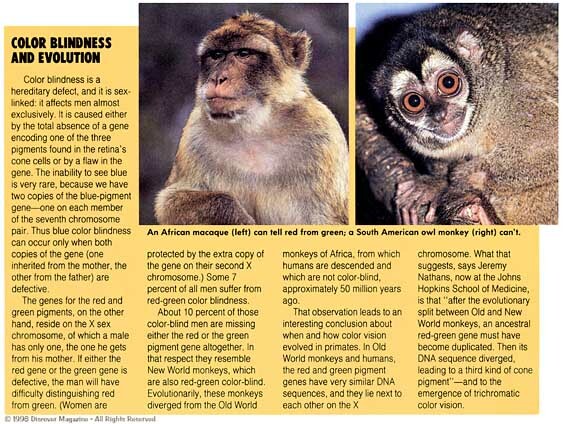 Interestingly enough, most primates which evolved in Africa, Europe and Asia and environs posses a similar wide range as ours, while those which evolved later in "The New World" of the Americas usually have the narrower range of human color deficiency. (If some of the ideas below are unclear at first, please stick with it, as many are better explained later on. For ex., this one is covered HERE.) The technical distinction is between: "trichromats (human and old-world primates)" and "dichromats (new-world primates and the common human color deficiencies)." Anyway, I built a lot of amusing devices way back in grade-school that allowed me to tinker with mixing various colors, both with paints (subtractive mixing of: magenta, yellow and cyan [note: school kids and dummies usually call them: red yellow and blue!]) and with colored lights (additive mixing of: red, green and blue). I read everything on color I could get my hands on, and with many years of more or less scientific experimentation, I thought I knew a bit about the subject. But I was wrong. 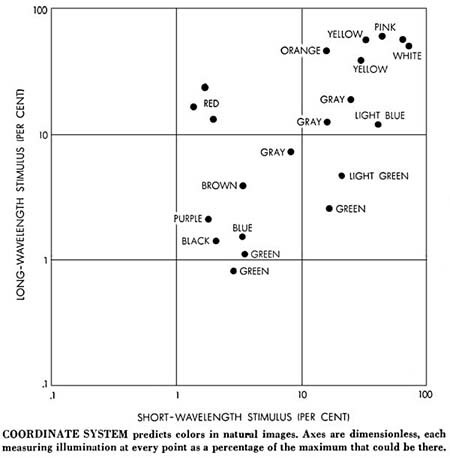 In the May 1959 issue of Scientific American an article appeared which challenged our understanding of the way humans and most mammals see in color, at least partially. The idea of having rods and cones in the retinas of our eyes was understood to some extent back to Raleigh (that versatile 19th C. scientist), who postulated the three versions of cones: Red, Green and Blue. We could see color in brighter light by the interplay of the different colors around us, as they reflect and are detected by those three color sensitive cones. While in dim light the more basic and much more sensitive rods come into play. These are sensitive to green light mainly, and form only a monochrome image, although we probably don't much think about that: seeing in B&W when the light level is very low. Edwin Land, the inventor of Polaroid filters, from whence his company, The Polaroid Corporation got its name, was well know at the time more for his "instant photo" cameras, a picture in a minute. He'd developed the first monochrome Polaroid camera in the late 40's, after yielding to the impatience of his tiny daughter's wish: to see some vacation snapshots right away, not days or weeks later. While the sales of monochrome self developing cameras and film was good, the real test was to come up with a way to do it in full color. Land decided to start at the top, trying to figure out how we saw in color, what was necessary, and what was not. In working with three slide projectors with the classic idea of three images, one for each RGB "primary" (red - green - blue), taken on B&W film, then combined in projection using filters of the same three primaries, a simple accident occurred one day. Someone knocked off the green filter from the middle projector. Before it was put back in place, Land and his assistants noticed that the image on screen still looked about the same as before. What gives?! Now the green component was being projected with white light, not limited to its own color. Surely that should have changed the coloration a lot. But it did nothing of the sort. Land was puzzled. Was the traditional view wrong? He tried fiddling with the brightness of each projector, but the image stayed about the same again no matter. Hmm... he turned off the blue projector entirely. But now what was going on? Once again, the image continued to display in fairly normal full color! There he was, staring at a color view, when logic said all that ought be seen right now was the red from the red projector, and white from what was the green projector! In other words, all that ought to have been visible were shades of white, pink and red, and of course, black. What was creating the blue, the yellow, the magenta and green tones that were evident on the screen? Land removed the two slides. Sure enough, the screen became a bland pink. They slides were reinserted -- full color again! The red filter was removed, so only white light from two B&W slides was being shown. And, wait for it, the scene reverted to black and white, so somethings still made sense. What didn't make such good sense was what happened when the red filter was again dropped into place -- full color sensations returned. There's a lot more to it than this capsule story, and it inspired an whole new theory to describe our color vision ability, of eyes and brain. Since both retinas of the eye and cerebral cortex of the brain were involved, Land coined a new word for the process: Retinex. It supplements, and in many cases replaces, the previous understanding, and it represents a true paradigm shift in our understanding of this extraordinary ability we embody. The first widely available publication of the results of Land's investigations came out in that issue of Scientific American. 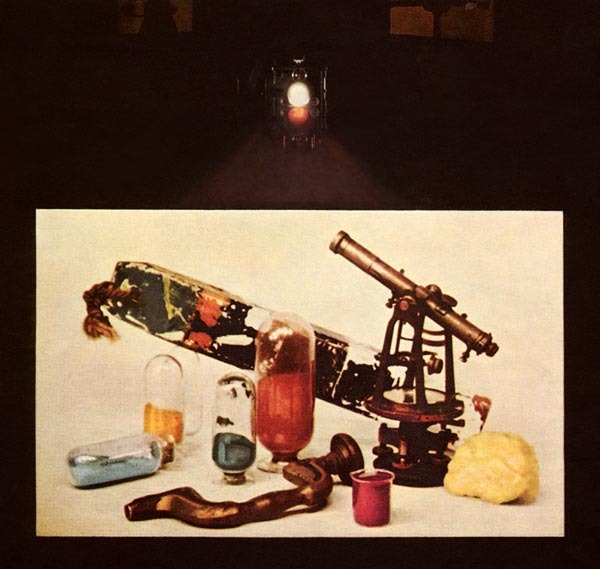 The cover of the magazine featured the view above. It's a color photo that was taken during one of the experiments which the article describes. You can see a double projector at the top, with the upper lens projecting a white image of one B&W slide, the one below projecting a red filtered one of a different B&W slide. Both shine and merge onto the translucent screen we can see through below. On the screen we can at the results -- a reasonably full color image, similar to what you would view in that room. I was mesmerized by the images and article inside this issue, and would like to share a bit of that awe and mystery with you on this web page. Here you'll see what those slides are all about. Yes, just two monochrome images to look at (remember, Land had turned off the blue projector, leaving just the red and unfiltered green slides active). Click on it as usual to open a new window with a large view. Hold it aside or just close it to return to our text. This is what the camera "saw," not flipped left-to-right as on the Scientific American cover, where it's seen THROUGH that translucent screen. The upper version was taken with a red filter over the lens. 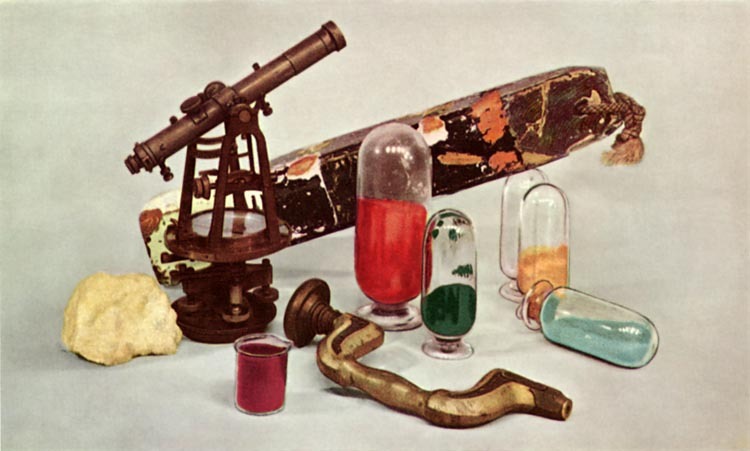 It's an elegant still life arrangement of some old nautical artifacts, and a few laboratory glass jars and beakers containing colored powders in several colors. The lower of the two photos is taken from the same location exactly, same B&W film, but now a green filter was used over the lens. If you compare carefully you'll see that some features are light colored in the upper view, much darker in the lower view. These objects contain a lot of longer wavelengths, or orange through red color tones. Other objects are the other way around, and these contain mostly blue or greenish tones, which have shorter wavelengths. Those that are nearly the same in both slides are the monochrome tones, white, gray, brownish gray and black. This image is from a scan I made and very carefully tweaked to match as closely as possible the original colors given in the article. I've not retouched the upper two monochrome photos at all aside from a few tiny dust specks and printing glitches. 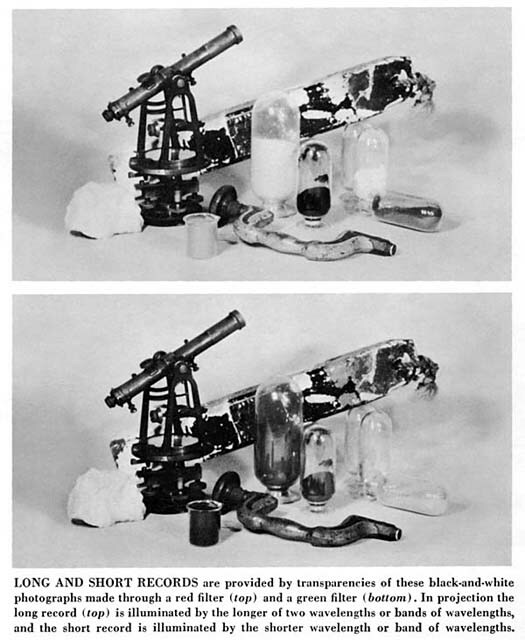 You can see that the backdrop was a simple light gray sheet, the wooden buoy or float has some orange and green paint undercoat showing behind worn patches of white and black, the theodolite telescope is brownish bronze, the sponge to its left the usual light yellowish tan, the wooden brace in the center shows ordinary wood tones, and there are glass containers with wine colored powder, deep red, jade green, yellow ochre, and a light blue-gray tone. Notice how they are positioned more or less "naturally," with the colors spread essentially at random in the view. That's important, believe it or no. If you will now click on this multi image you'll see how we can come close to duplicating what Land described in the article. Up at the top of the bigger view you'll see two small versions of the original two B&W slides, side-by-side. Since we have no way to telnet a pair of projectors to you (now THAT would be some download, even for T1 speeds! ;^), we'll resort to the same trick color television has used for years: we'll pass the pictures through a grid of alternating lines, one in each primary color. The monitor you are now looking at this page with probably uses the same system, although the grid for most decent computer monitors is very fine, very subtle, the stripes or segments or even dots lying closely together. There are three different colored strips or dots: red, blue and green, on your monitor screen. Grab a magnifying glass and take a look, see what yours uses, lines or dots or something else. In this case we're going to duplicate the Land experiment of two colors: white and red. So I've sliced the original red image up into the narrowest strips we can view in a browser, 72 dpi. The image follows a grid of 36 horizontal strips per inch, alternating black or image slice, from top to bottom. The image slices then are colored red. The other image from the green version remains in white tones on screen, sliced again into 36 horizontal strips, same spacing, black or image slice. But the black strips are located where the first image has its red image features, and the visible image slices are located where the red toned image has its black stripes, like shuffling two halves of a deck of cards together. 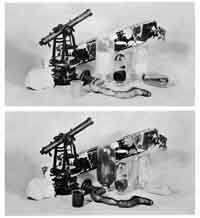 The second side-by-side pair of images shows what happens before combining the two. One effect of black strips is that the brightness is somewhat dimmed, but that's what any "additive" color system does: limit each element to a narrow region of one color. Filters will remove some overall light from each color, leaving only the hues you want. And when you restrict each color only a portion of the total available screen area (one-third, or one-half), down goes the brightness. Anyway, that's why the second pair looks dimmer. Yes, the grid is too visible at this small size. But let's go ahead drag copies of each and carefully overlap them so each adds whatever brightness it has to the other, alternating along the grid. Do you see the colors yet? Well, these are tiny versions. Let's go through the same steps at a more reasonable size. Since I don't know what size your monitors all are, I've prepared two versions, one medium sized, the other larger. These are both below. The views are surrounded by flat black, so you can block some of the other lights and colors coming from your screen. To do it correctly, step back a little from your screen, and perhaps grab a small tube like the kind toilet tissue comes on. Cut one of those into two shorter lengths, and hold them rather like binoculars in front of your eyes, to block every bit of light except from the image. This will be a very decent duplication of what Land and his collaborators saw back in the late-50's. You might also try to squint slightly with all of the images shown here, so your eyes will average the colors together more than if seen sharply, and let Retinex do its best. Pretty neat to see so many colors where only red and white are actually present, isn't it? Go ahead, take a look for yourself! Notice that this color pair, yellow-blue, will be featured on a later page, on a completely different topic, that of "colorblindness." Then we'll try to collide the two ideas together in some rather surprising ways, with images to demonstrate what's going on. I can promise that there are a few smiles in store, and the more one knows about it, the more magical the whole thing becomes! Land and his team tried to make sense of what was happening before their astonished eyes. One thing they did right away was to measure the brightness levels of various places on those two transparencies. 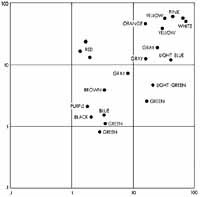 The calculated the density of chosen points by measuring the monochrome slides, compared these as we might have done above, with the colors the eye saw at those places, and plotted some of the results on charts like the one above. Click it to see a nice larger version as usual. Notice that the "scales" on the side are not in any definite units of measurement. Instead everything is in purely relative terms, pretty much as our eyes seem to do it. There's a relative "maximum brightness," and a relative "minimum brightness"; there's one of them for the redder long wavelengths, and one for the shorter wavelengths, too. In this chart the upper right is the lightest region, the lower left is the darkest. The longer wave image is measured vertically, the shorter wave image horizontally. If both of the values change exactly together, the picture elements will lie along a diagonal line going from lower left to upper right. And when you check it out here, that's where you find the locations that look gray, black and white. A dot placed above such a diagonal tends to have longer waves, or be "redder," when placed to the right it tends to have shorter waves, or be bluer. Green tends to be found further to the lower right than bluer tones, which tend to lie just below the neutral gray diagonal. This chart was probably taken from the same still life we've been looking at, and you can see nicely here where the brightness tones that we've been talking about are found, which are the more or less important ones for a given sensation of color. The crucial thing is that these were taken from a naturally occurring random disposition of objects. You couldn't just insert a step wedge of values as the chart might suggest, going from black in the lower left corner, red at the top left, pink at the top right, and white at the lower right. Such a step wedge pair of slides would produce only those pinkish tones and nothing more! It's a real world image that lets the magic work. Just click the image below to see a real additive example, made exactly like those still life examples above, using red + white light. The only difference is the missing "real world" slides (I kid thee not). And wotta difference! So we experiment with more chaotically colored images, as you might take with a camera or draw yourself in any medium you're good at. The more "hodgepodge" there is, the better, as far as the eye is concerned. Perhaps those faded videotapes we watch look better and more vivid when we step back if there's a complex sequence of moving images on the screen, rather than a minimal and static arrangement. The eye has evolved its sense of color because it gives us some kind of survival benefits, and clearly what emulates real life in complexity of details and motion are where the eye works best, and gets all of the information it can from even limited stimuli. "Duck, there's an orange boomerang headed right at you, from between those two trees ahead!" There's one final element that we've not yet touched on. These examples, except the one in yellow and blue, have been presented using red and white light, because that combination works well and is easy to reproduce. It's also historically what Land saw that got him started on this detour which only gradually led to the practical goal: color Polaroid "instant" photos. That invention arrived, I remember, with the SX-70 camera in 1971. I marveled at the breakthrough, while at the same time didn't much care for the extreme contrast. The color Polaroid film uses the conventional three colors, RGB. But we now know that quite a lot of information can be gleaned from just two. For Retinex almost any color pair will work..
Two yellow lights with very narrow, close together spectrums will do the trick. Yellow works well for either the long or short stimulus. It becomes the redder one when paired with green, or the bluer one, when paired with red, isn't that a surprise, now. To the eye full color images still come through plain and clear, but we can't take color snapshots directly that show the same effect. Once the originating spectral colors are unavailable, as with color video and computer monitors, the options become limited. The eye is just "smarter" than any camera. You realize that right away after you view and photograph objects under tungsten light, or at sunset, or with fluorescent lamps, compared to clear daylight. Your eye sees the same colors for the objects view all the time. A digital CCD or color emulsion does not, and must either be filtered to correct for the light, or adjusted later when printed or duplicated. Our natural Retinex perceptions are even cleverer, an certainly more sophisticated than we ever suspected before!